In this work we summarized our own material on studying of the spatial organization of normal epithelial and stromal and also tumor tissue. It appeared that normal epithelium and stroma consist of morphofunctional zones, which include 2 subunits with 12 cambial cells in each. During the division of the first subunit 12 cambial cells, 12 pairs of mother and daughter cells occur. They excite the electric field in which the differentiation of the daughter cells takes place. When the quantity of the cambial cells decreases to 6in one subunit, the differentiation is absent, so it leads to the malignant tumor development. The number of cambial cells decreases with aging, and in people over 75 years old it reaches 7 cells in one subunit, that is very close to the limit level (6 cells) when the differentiation is absent. Therefore In this age group the risk of cancer development is very high. Along with this the decrease of cambial cells number with aging is caused by the function of central morphofunctional zone – hypothalamus. The structural organization of tissue attracts great scientific interest as processes of proliferation and differentiation of cells and, therefore, the mechanisms regulating these processes are closely connected with it. Disturbance of these processes can lead to the development of a malignant tumour in the organism. From literature it is known that all the cells of the epidermal basal layer and epithelial tissue are grouped into the epidermalproliferative units (EPU) [1-3]. The central group of cells including a stem cell and peripheral cells are the part of such unit [1,4,5]. The behaviour of a stem cell is defined by a socalled niche, i.e., a cellular environment of a stem cell. For the first time the idea of existence of niches was put forward by Schofield . The author assumed that hemopoetic stem cells are surrounded by the other cells and become the fixed stem cells. During stem cell division only one remains as a mother cell and the another daughter cell is exposed to a differentiation. But if the daughter cell finds and occupies the niche, it also will become the stem cell for maintenance of cambial elements population. A regulation of stem cells quantity according to Booth, Potten , must be very careful, because one odd stem cell in a crypt of a small intestine can produce from 60 to 120 additional cells. But how are carried out the proliferation and the differentiation of stem cells in tissue structures? For this purpose it was necessary to concretize accurately those morphological structures, which define vital activity of stem cells, and then to reveal the principles of their functioning. It appeared, that morphofunctional zones were such structures [7-9]. What is a morphofunctional zone in norm? The concept the morphofunctional zones has been developed by us by the analysis of the spatial organization of various epithelia (eye corneal anterior epithelium, mouse ear skin epidermis in the experiment; human skin epidermis, epithelium of a small intestine, pulmonary epithelium). It is revealed that epithelial tissue consists of the morphofunctional zones with 2 subunits in each (Figure 1). One subunit includes 12 cambial cells. First, the cambial cells of the first subunit divide and then of the second. As a result of the division, 12 pairs of mother and daughter cells are formed in each subunit. Figure 1. Normal epithelial morphofunctional zone. 1) mother cell, 2) daughter cell in the activated mother and daughter cells pairs, 3) nonactivated cambial cell. Cambial cells have a division axis, vertical in relation to a basal membrane, therefore the mother cell settles down near a basal membrane, and daughter – at some distance from it. The electric field is excited between these two cells, because the body of the mother cell remains constricted due to the action of the growth factors with high spastic properties (TGF-β type), which are located in the basal membrane . It leads to the fact that the density of the chromatin having a negative charge increases in the mother cell in comparison with the daughter cell. Therefore between these cells there is a redistribution of superficial charges and the emergence of some electric field. The spasm prevents the stretching of the mother cell nucleus and protects it from a differentiation. At the same time its division axis remains vertical in relation to a basal membrane. Unlike the mother cell the daughter cell stretches in the electric field, changing the direction of the division axis from vertical to the horizontal (Figure 2) and taking a form of strongly curved ellipse (Figure 3). Unlike charged mother and daughter cells attract to each other, forming a circular structure (Figure 4). Figure 2. 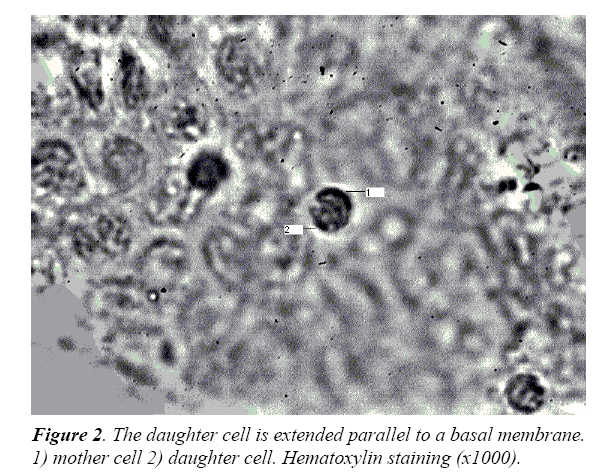 The daughter cell is extended parallel to a basal membrane. 1) mother cell 2) daughter cell. Hematoxylin staining (x1000). Figure 3. The daughter cell (2) strongly bends towards the mother cell (2). Hematoxilin staining (x1000). 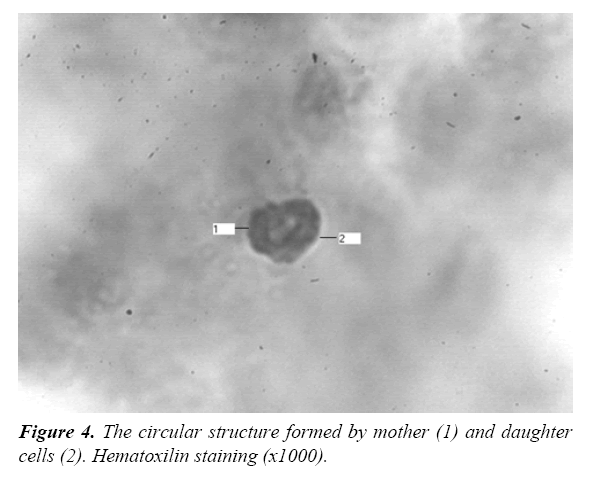 Figure 4: The circular structure formed by mother (1) and daughter cells (2). Hematoxilin staining (x1000). As a result, the certain loci of chromosomes fixed to nucleus membrane are untwisted, and also the possibility of their transcription appears in a daughter cell. At the same time a centromeres, fixed to the nucleus, move to the leading edge of the cell, defining its polarity. Thus, the differentiation of a daughter cell occurs in the electric field excited by 12 pairs of mother and daughter cells of one subunit of a morphofunctional zone. It is important that in each subunit not all 12 cambial cells enter into mitosis simultaneously: first the first 6 cells proliferate, and then the other 6. When the first 6 cells enter into mitosis the differentiation of daughter cells is absent, because such quantity of cells excites the electric field insufficient for stretching of a daughter cell (Figure 5a). Figure 5. Features of cambial cells proliferation and differentiation in one subunit of the morphofunctional zone. First 6 cells enter into the mitosis. (a)The differentiation of daughter cells is absent. (b) When the other 6 cells enter into mitosis the differentiation occurs. The differentiation takes place only at the entering of the other 6 cells of the same subunit (Figure 5b). However epithelial daughter cells can’t be stretched and differentiated in the electric field until their cortex, which is constricted due to their own growth factors, will be relaxed. The function of cortex relaxation of epithelial cells is performed by stroma. It appeared that in stroma on the other side of the basal membrane there are the same morphofunctional zones. The principle of work of the stromal and epithelial morphofunctional zones is identical: during the division of 12 stromal cambial cells of one subunit 12 pairs of mother and daughter cell are formed, in the electric field of which the differentiation of stromal daughter cells takes place (Figure 6). Figure 6. The epithelial-stromal morphofunctional zone is norm. Interaction of epithelial and stromal components in one of subunits (scheme). (1) activated cambial cells (2) non-activated cambial cells. Two key proteins participate in the process of daughter cells differentiation – the Src-kinase and RhoA . Stromal growth factors, such as FGF, activate abundantly the Src-kinase through its SH3 domain in epithelial cells. Then the activated Src-kinase reduces RhoA expression because it activates the protein p190RhoGAP, which in turn inactivates RhoA. But RhoA participates directly in the formation of formins, the multidomain proteins, which form the cell cortex. Therefore, the decrease in the RhoA level leads to reduction of formins quantity in the epithelial cells cortex and to its relaxation. Only after this the stretching of the epithelial cells in the electric field, excited by 12 pairs of mother and daughter cells, is possible. In process of daughter cell stretching and enlarging of its sizes there is the increase of the exocytose bubbles splitting off from the membranes of Golgi complex for the inserting into the cellular membrane. It leads to emission of a new portion of the inactive Src-kinase which is located on these membranes. However in this case the Src-kinase becomes active already through its SH2 domain. Really, the Src-kinase participates in the formation of microtubules, thus the large protein complexes including the Src-kinase, PI3K and γ-tubulin are formed on the membranes of the centrosomes. P3K actively interacts with tubulin and phosphorylates it. The Src-kinase has low affinity to γ-tubulin therefore interacts with it after its activization, binding to its phosphotyrosine residues due to Src-kinase SH2 domain. Development of microtubules promotes the formation of intermediate filaments which altogether stretch the cell nucleus. Thus, the Src-kinase, activated due to its SH2 domain, is responsible for the development of the cell cytoskeleton and differentiation. Interestingly, that the stretching of the chromosome sites in the epithelial cells and fibroblasts has the features. It is known that at the end of the mitosis the chromosomes have a certain anatelophase orientation. After the proliferation of the cambial cell with a vertical axis of division, the centromeres will settle down in the top of the daughter cell, and telomeres – in low part; in the mother cell – vice versa (Figure 7a). Figure 7. (a) Ana-telophase orientation of chromosomes of mother and daughter cells at the exit of a cambial cell from a mitosis and (b) formation of an epithelial daughter cell. If the cambial cell divides in the epithelium, the low departments of the daughter cell, adjacent to the mother cell, will be stretched during of the electric field action (Figure 7b). It is connected with the fact that the epithelial microenvironment having growth factors with spastic activity, will prevent the stretching of the upper pole of the daughter cell. Therefore, loci of chromosomes will be stretched near the telomeres, causing the epithelial differentiation. At the same time the expression of RhoA will moderately prevail over the Src-kinase because the stretching of a daughter cell is not so considerable. When division of the cambial cell happens in stroma, then the growth factors of the microenvironment, having the relaxing effect will relax a cortex of the top pole of a daughter cell (Figure 8). It will lead to intensive stretching of a daughter cell near the centromeres, considerably strengthening the Src expression and defining the stromal differentiation. Therefore the Src-kinase will moderately prevail over RhoA in the fibroblasts. In this regard the circular structure at the fibroblast formation has more elongated form in comparison with epithelial cell (Figure 9). Figure 8. (a) Exit of the cambial cell from a mitosis and (b) stretching of a daughter cell during fibroblast formation. Figure 9. Stromal circular structure. 1) mother cell, 2) daughter cell. Hematoxilin staining (x1000). Thus, the influence of the electric field and microenvironment on a daughter cell is directed to strict respect of a ratio between two key proteins: the Src-kinase and RhoA, because it defines a concrete differentiation of cells. However the proportion between these proteins is important not only for a differentiation of cells, but also for proliferation. Really, proliferation and a differentiation are two interconnected processes. For cell proliferation it is necessary that RhoA expression more than moderately exceedes the Src-kinase, because the Srckinase inactivates some part of RhoA (Figure 10a). Therefore, under such condition a considerable part of RhoA protein will remain active. It will lead to the production of a large number of the formins necessary for the formation of a contractile ring. Under other conditions the proliferation is absent. Figure 10. An expression of the S-kinase and RhoA causing proliferation of cells . ( I) proliferation (II) proliferation does not occur if the Srckinase expression sharply exceeds the RhoA expression (III) proliferation is absent if the RhoA expression sharply exceeds the Src expression (a) proliferation of fibroblast requires larger increase of the RhoA expression than (b) epitheliocyte. If the activity of the Src-kinase is considerably increased in the morphofunctional zone, then it will cause an inactivation of RhoA and weakening of the proliferation. On the contrary, if RhoA expression considerably exceeds the Src-kinase, then the spasm of cells will increase, that also reduces proliferative activity of the cells up to a full stop. As mentioned above, the RhoA expression moderately prevails over the Src-kinase in the epithelial cells, and the Src-kinase moderately prevails over RhoA in fibroblasts. Proliferation of the epithelial cells requires only insignificant strengthening of the RhoA expression in the morphofunctional zone (Figure 10b). It explains high proliferative activity of the epithelium. Division of the fibroblasts requires already significant increase in the RhoA expression in the morphofunctional zone, therefore they are less active in comparison with epithelial cells. In literature there are data that tumour tissue, as well as normal, consists of EPU, i.e., the structural organization of tumour tissue at this stage isn’t changed [5,12-14]. Therefore, the disturbances leading to the development of tumour process happen at other level of the tissue organization. In our work we have revealed that morphofunctional zone, uniting 24 EPU, is a source of the tumor development, because the changes happening in the zone during tumour process lead to violation of the processes of proliferation and differentiation of the cells. It is shown above that two key proteins: the Src-kinase and RhoA participate in the processes of the proliferation and the differentiation in a normal morphofunctional zone. Function of these proteins is closely connected with the quantity of cambial cells which define the Src-kinase expression during the process of daughter cells stretching. Therefore, the cancer can develop at the Src-kinase decrease in daughter cells due to the reduction of the cambial cells quantity or via the other reasons. When we studied the esophagus dysplasia and cancer, the breast cancer, we revealed that the malignant tumor develops from one subunit of the normal epithelial morphofunctional zone, in which the quantity of cambial cells decreases not less, than twice (Figure 11) [7,15]. At the same time the underlying stroma is not changed. At the entering of such subunit into mitosis, only 6 pairs of mother and daughter cells will function (12 pairs in norm). 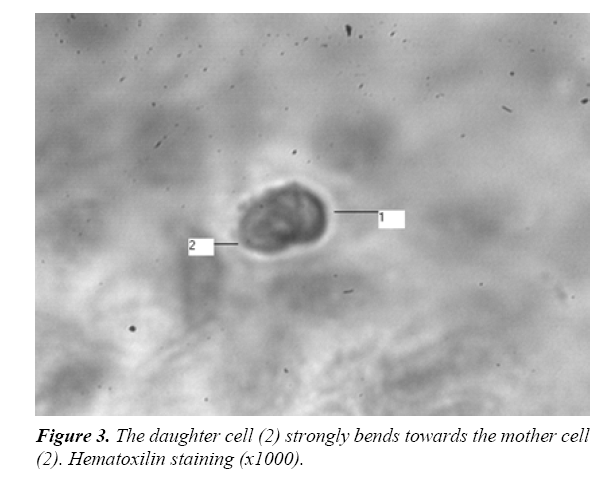 However, daughter cells in this case will not undergo a differentiation, because 6 pairs of mother and daughter cells excite the electric field insufficient for stretching and a differentiation of these cells. As mentioned above, the cells of the stromal morphofunctional zone relax a cortex of the epithelial cells before their stretching in the electric field. Because in the pathological subunit there are only 6 daughter cells, therefore 6 stromal daughter cells will be “odd”. At the entering of the second subunit into the mitosis these 6 “odd” stromal cells of the first subunit due to their regulatory factors will influence immediately over the 6 epithelial cells of the second subunit. It will cause the relaxation of the epithelial daughter cells of the second subunit and a possibility of their stretching in the electric field. However the stretching and the differentiation of the daughter cells in this subunit, as well as in the first subunit will not occur, because the electric field of both subunits is excited by 6 pairs of mother and daughter cells, at which the differentiation is absent. Besides, there is no interaction between these two weak fields. Therefore with a cancer progress there is a certain type of symmetry – concentricspherical, at which in concentric orbits single cancer structures are located (Figure 12). Figure 11. The morphofunctional zone during malignant tumor development: the fields of two epithelial subunits don't interact (scheme). (1) activated pairs of mother and daughter cells (2) non-activated pairs of mother and daughter cells (3) 6 stromal cells of the first subunit relax the cortex of 6 epithelial cells of the second subunit. Figure 12. Concentric-spherical symmetry in the cancer growth. Staining after Pappenheim (x400). Thus, in pathologically changed subunit, in which the quantity of cambial cells falls to 6, undifferentiated daughter cells appear. In the latters the activization of the Src-kinase through its SH2 domain, which is necessary for the cytoskeleton formation, is very weak. It leads to critical reduction of microtubules, intermediate filaments quantity, decrease of quantity and size of focal adhesions and reduction of cell spreading. Because the Src-kinase activity decreases and RhoA increases, the stretching of the daughter cell parallel to a basal membrane will be insignificant, i.e., the main axis of the cell will move to the vertical position (Figure 13). Therefore weak untwisting of chromosomes will be observed not only near telomeres, but also centromeres. Therefore, the phenotype of fibroblasts can appear in epithelial cells with tumor progress. Figure 13. Emergence of phenotypes of fibroblast and epitheliocyte in one cancer cell. So, cytokeratin and vimentin microfilaments, and also growth factors with the spastic and relaxing action that is necessary for cell growth and division, can be expressed together in the same cell. It leads to the fact that the cancer cell becomes independent of the presence of serum growth factors . The arrangement of the main axis of the cell at an angle to a basal membrane determines growth of tumor cells in the form of node. Increase of RhoA expression in tumor leads to strengthening of proliferative activity of tumor cells, because for the entering of such cells into proliferation, the RhoA activity in the morphofunctional zone must be increased much less than in norm. Therefore these cells enter into mitosis very easy. Thus, decrease of cambial cells quantity in one subunit of the morphofunctional zone is one of the main conditions of malignant process emergence. Really, decrease of cambial cells number to 6 leads to the development of the malignant tumor, and depression of cells to 8 causes formation of a benign tumor. On the example of breast fibroadenoma in patients from 40 to 60 years old it is shown by us that the benign tumor, as well as cancer arises in one subunit of a morphofunctional zone, at the same time the underlying stroma is not changed (Figure 14). However the quantity of cambial cells in it is reduced only 1,5 times. Therefore the cambial cells number in such subunit is 8, and in the corresponding subunit of a stroma – 12, i.e., the stromal cells is on 4 more. Then, at the entering of the second subunit into mitosis these 4 “odd” stromal cells of the first subunit will relax the cortex of 4 daughter epithelial cells of the second subunit. Figure 14. The morphofunctional zone at the fibroadenoma formation: interaction of fields of two epithelial subunits (scheme). (1) activated pairs of maternal and daughter cells (2) non-activated pairs of mother and daughter cells (3) 4 stromal cells of the first subunit relax the cortex of 4 epithelial cells of the second subunit. In spite of the fact that the electric field, excited by 4 mother and daughter cells pairs of the second subunit is below threshold level (it is excited by 6 pairs), stretching of the daughter cells and a differentiation in this subunit will occur, because the field of the first subunit is excited by 8 pairs that exceeds a threshold level. It leads to an overshoot and interaction of fields of both subunits. The daughter cells from electric field with smaller value will deviate towards daughter cells from the field with larger value, forming polarization vectors. Therefore, during each proliferative period the quantity of vectors will increase on 4 until they become 20, because the cambial cells quantity in both subunits is only 20 (8+12). On the example of nodal hyperplasia and benign tumors of thyroid glands Yagubov and coworkers revealed  that the centers of non-cancer growth have radial-ray symmetry; at the same time the quantity of sectors in these centers compounds 4, 8, 12 and 20, that is agree with our data (Figure 15). Figure 15. Radial-ray symmetry in non-cancer growth. Growth vectors in the form of rays disperse extensively (shooters).Staining after Pappenheim (x400). Growth vectors in the form of rays disperse extensively (shooters). Staining after Pappenheim (x400). Thus, the quantity of cambial cells in a morphofunctional zone plays an important role in development of malignant and benign tumors. Depression of cells number can happen under the influence of various local factors: physical, chemical, etc. But whether there are general mechanisms reducing quantity of cambial cells in a morphofunctional zone. When we studied the morphofunctional zones in norm we revealed the decrease of cambial cells quantity with aging. However their number remains quite stable up to 60 years and compounds 12 cells in one subunit. Then in people from 61 to 75 years old their quantity decreases a little to 11 cells and over 75 years old sharply falls to 7 cells in one subunit that is very close to the critical level (6 cells) when the differentiation is absent. Therefore the risk of a malignant tumor development in old people is high. But there is a question: why does the quantity of cambial cells decrease with age? Data show that the reduction of cambial cells quantity happens not gradually, but definitely, that argues about hormonal dependence of cambial cells number. It appeared that the hypothalamus which is the important vegetative center of a brain regulates the quantity of cambial cells in the morphofunctional zone and at the same time represents the central morphofunctional zone (Figure 16) . As well as in epithelial morphofunctional zone, RhoA expression in hypothalamus prevails over the Src-kinase. It is connected with the brain development of ectodermal tissue with high RhoA activity in the embryogenesis. Epiphysis, producing melatonin, exerts very great influence on the hypothalamus, strengthening RhoA activity in its cells. It strengthens a spasm of neurocytes, responsible for hormones production, complicates exocytosis and thus prevents the development of many hormones by the hypothalamus. Figure 16. Decrease in RhoA activity of a hypothalamus leads to activization, and then exhaustion of hormonal system of an organism (scheme). In the puberty the production of estrogens, which activate the Src-kinase, amplifies. It leads to decrease in RhoA activity of the brain including the hypothalamus and causes activization of hormonal system. The puberty comes itself due to ontogenetic assimilation of cholesterol, on the basis of which estrogens are produced. Fermentative systems on digestion of cholesterol begin to work in people from 7 years old. The hypothalamus regulates function of gonads by means of the releasing-factors. In gonads instead of the died follicles the interstitial tissue develops which begins to produce estrogens that leads to the hyperestrogenemia. During this period the expression of the Src-kinase will increase in the cells of gonads. Gradually such increase will lead to fibroblast-like phenotype of the cells with stretching of chromosomes near centromeres and to development of connective tissue. The sclerosis in gonads tissue will amplify that will cause fading of their hormonal function. It in turn will cause approach of the period of hypoestrogenemia. In the period of the hyperestrogenemia estrogens as hormones of a wide biological range of action influence superfluously not only over target organs, but also a brain and other peripheral organs and tissues. The Src-kinase expression, which is initially high in the fibroblasts, will raise even more in them, because fibroblasts have many receptors to estrogens. Thus, during this period influence of stroma upon the epithelial tissue amplifies. As a result, reorganization of the cytoskeleton and stretching of chromosomes of epithelial cells occur closer to centromeres, that will lead to gradual transformation them into connective tissue cells. Therefore there will be a growth of connective tissue over time and decrease of parenchymal organs functions. The similar mechanism of connective tissue growth is available also in the hypothalamus when RhoA activity of the brain decreases. Increase of the Src expression in the fibroblasts will lead also to the fact that they will enter into the proliferation more slowly, because substantial increase of RhoA in the morphofunctional zone is necessary for this purpose (Figure 17). RhoA activity of epithelial cells will decrease under the influence of the Srckinase during this period. Therefore the proliferative activity in these cells as well as in fibroblasts will suffer, because the larger strengthening of RhoA is required for entering of epithelial cells into mitosis in comparison with young people. Figure 17. Strengthening of influence of stroma upon the epithelium in the period of hyperestrogenemia (the explanation in the text). Thus, in the period of hyperestrogenemia proliferative activity both of stromal and epithelial cells begins to suffer, however the quantity of cambial cells remains not changed yet. Therefore the sarcoma or cancer can develop in people of this age under favorable conditions. For example, among the local mechanisms it is possible to call injuries, at which an immediate depression of cambial cells number happens. Besides, the cambial cells quantity may be stable, but the expression of key proteins due to the local factors can decrease and cause the same effect as the falling of cambial cells number (for instance, ultraviolet or inflammation, which activate Src-kinase and consequently reduces RhoA) . The central mechanisms also play a large role in the malignant tumor development during this age period. For example, various stresses, long bright light, a smell excite not only nervous impulses in a brain of the person, but also activate paths of transduction with a high expression of the S-kinase. At first it leads to considerable decrease in RhoA expression of the brain, to strengthening of the exocytosis, increase in metabolic communications, but then to a stock depletion of mediators and decrease in reactivity of neurons, and then to general decrease in RhoA activity of the brain. As a result it causes strengthening of hyper- or hypoestrogenemia effects, which in turn lead to decrease in cambial cells number in peripheral organs. Further, in the period of hypoestrogenemia influence of stroma upon epithelial tissue decreases (Figure 18). The Srckinase expression in the fibroblasts falls that results in larger proliferative activity of fibroblast, because for their proliferation it is required to strengthen the RhoA expression only a little in a morphofunctional zone. The reduced quantity of the Src-kinase can’t decrease RhoA expression considerably in the epithelial cells, which leads to strengthening of the RhoA activity in these cells and to increase of the rigidity of the cortex. It in turn leads to decrease in proliferative activity of all the cells including cambial in the epithelial morphofunctional zone. Proliferative activity of epithelial cells in the period of hypoestrogenemia suffers more than in hyperestrogenemia. It is connected with the fact that in the period of hypoestrogenemia the epithelial cells cortex rigidity, which prevents the proliferation and differentiation, can’t be lowered by very weak influence of stroma. Thus, the first decrease in cambial cells number (to 11) is revealed by us in people of 60 years old on the background of hypoestrogenemia. Further increase in the rigidity of epithelial cells very sharply reduces proliferative activity and quantity of cambial cells, because the spasm of the cells increases. It leads to falling of cambial cells number to 7 in one of subunits of the morphofunctional zone, which is very close to the limit when the differentiation of cells doesn’t occur. Thus, epithelial tumors occur much more often than stromal in people of senile age, because of the larger susceptibility of an epithelial component in this age . Figure 18. The scheme of weakening of influence of stroma upon epithelial tissue in the period of hypoestrogenemia (an explanation in the text). So, in the period of hyperestrogenemia the local mechanisms play the main role in the malignant tumour development and central mechanisms – a supporting role, performing function of the background, aggravating the course of pathological process; then at advanced age in the period of hypoestrogenemia major importance is attached to the central mechanisms, because there is a critical decrease in RhoA activity of the brain. Thus, the research has revealed that cells in tissue are united in the morphofunctional zones consisting of two subunits with 12 cambial cells in each. In the subunits of a zone there is a proliferation and a differentiation of daughter cells in the electric field excited by 12 pairs of mother and daughter cells which have turned out at cambial cells division. In the daughter cells during stretching in the electric field there is an expression of the Src-kinase which provides development of a cytoskeleton of cells and a differentiation. When the quantity of cambial cells in one of subunits all to 6 due to action of local factors, the differentiation of daughter cells will be absent, because the field excited by such quantity of cells isn’t enough for a differentiation. At the same time the expression of the Srckinase will be very weak that creates conditions for malignant tumor development. With aging the quantity of cambial cells in the subunits falls, and in people over 75 years old compounds 7 cells that is very close to threshold level – 6 cells when the differentiation is absent. Thus, in old people the risk of cancer development is very high. Lowering of cambial cells number is connected in turn with function of a hypothalamus which represents the central morphofunctional zone. Functioning of a hypothalamus in age aspect leads to decrease of Src-kinase expression in the epithelial cells of peripheral organs. It leads in turn to decrease of proliferative activity of cambial cells and their quantity. Hence, two mechanisms: local and central play the large role in cancer development. The local mechanisms prevail in young people, and the central - in senile persons. Booth C, Potten C. Gut instincts: thoughts on intestinal epithelial stem cells. J Clin Invest. 2000;105(11):1493-99. Letuchaya FM, Ketlinskiy SA. Formation of "functional units" of rats epidermis during it histogenesis. Tsitologiya. 1980;22:176-81. Savostyanov GA. Bases of structural histology. Epithelia spatial organization. 2006. Potten CS. The epidermal proliferative unite: The possible role of the central based cell. Cell Tissue Kinet. 1974;7:777-88. Potten CS, Booth C. Keratinocytes stem cells: A commentary. J Invest Dermatol. 2002;119:888-99. Schofield R. The relationship between the spleen colony forming cell and hemopoietic stem cell: A hypothesis. Blood cells. 1978:7-25. Yavisheva TM, Shcherbakov SD. Epithelial-stromal morphofunctional zones: Structure and functions. 2013. Yavisheva TM, Shcherbakov SD, Golubeva IS, et al. To a question of the structural organization of the basal layer and morphofunctional features of mouse epidermis cambial cells. Bull Eks Biol Med. 2004;584-8. Yavisheva TM, Shcherbakov SD, Sharafutdinov GZ. To a question of epithelial cells differentiation in the system of tissue units. Dokl AN. 2005;6:833-6. Yavisheva TM, Shcherbakov SD, Golubeva IS, et al. The relationship between dermal (fibroblasts) and epidermal cambial cells in the morphofunctional zone of mouse skin. Bull Eks Biol Med. 2007;144(11):594-9. Yavisheva TM, Shcherbakov SD. Features of proliferation and differentiation of cambial and daughter cells of an epidermal-dermal morphofunctional zone in a normal epithelium and at a cancer. Klet. Tehnol V Biol I Med. 2010;88-94. Grefner NM, Savostyanov GA, Hudoley VV. Studying of cellular mosaics of tumours of the Rana temporaria germ ectoderma by means of the scanning electronic microscopy. Eksperim Onkologiya. 1997;4(19):289-95. Savostyanov GA. The theory of the spatial organization of epithelial layers. Morfologiya. 2001;120:18-30. Yagubov AS, Danilenko VI, Bogush IG, et al. Stereomicroscopy in determination of symmetry of development of non tumoral processes and a cancer. Diagnostic medical morphometry. 2002;137-42. Yavisheva TM, Shcherbakov SD, Savluchinskaya LA. Features of morphofunctional zones work in the normal epithelium, breast fibroadenoma and breast cancer. Dokl AN. 2005:404(1):125-8. Yavisheva TM, Shcherbakov SD. Participation of morphofunctional zones in aging process. Advances in Aging Research. 2014;72-8. Yavisheva TM, Shcherbakov SD. Development of melanoma and cancer without decreasing of cambial cells number in morphofunctional zones. Advances in Bioscience and Biotechnology. 2014;5:493-500. Yavisheva TM, Shcherbakov SD. Morphofunctional changes of cambial cells and their derivatives in human skin in age aspect. Bull Eksper Biol Med. 2009;148:326-329.